Last night after the family was asleep I started checking on the mailing list for the upcoming SSI Update, our special private Newsletter for SSI Associates. Robin Snelson had just sent nearly a hundred new addresses and before the merge I took a moment to appreciate the people on the long-term list. My eyes were caught by the name Mike Combs. Mike has been a great Advocate and organizer and writer on The High Frontier for many, many years. Robin told me that he was one of the earliest HF Webmasters and many Space professionals know him from his legendary Space Settlement site (the original 1996-2014 pages are now hosted as a reference on the National Space Society servers at http://www.nss.org/settlement/MikeCombs/ ). He continues to run the SSI Yahoo group and when we started assembling the SSI Newsletter Archive Mike was the first to offer his personal copies of issues that we hadn’t yet found. He’s just a great, dedicated High Frontier person. A true shining star. Anyway, I finished merging the names and fired up the new SSI Facebook page to check that all was well… and I saw Mike had given the page a “Like.” A happy sight to end a day. Woke up this morning and flipped open the Google news to see the report that Stephen Hawking has given us all a deadline to get our butts beyond the limits of this Earth. The issues are listed like a tolling bell and the end-all goal is stated by the author of the article without hesitation: we have to find “Another Planet” that will make everything wonderful again for the chosen ones. So, let’s see. There’s a problem, a whole host of problems, caused by the limitations of squeezing the last drops out of a limiting planetary surface and the answer is… to pass through billions of miles of limitless resources and limitless raw energy and quick like scared little bunnies scuttle back down to hope for the best on yet another limiting planetary surface. Don’t they say that continuing to make the same mistakes while expecting a different result is a sign of insanity? I sent Bing looking for the original reference and came across this short Wikipedia entry that says that Ike recalled hearing it from Sagan. That entry ends with the line: “The counter-argument is that all the benefits of a planet can be achieved in space, usually by an O’Neill Cylinder type structure.” And looking an inch down to the source we see a link to Mike Combs’ “Somewhere Else Entirely”. Read Mike’s piece. Click the link and read it right now. 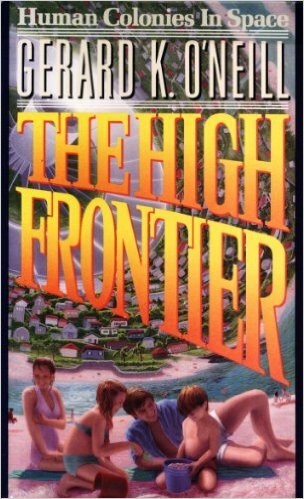 And if it’s been a while since you sat down with the details in The High Frontier, get your copy off of the shelf or go over and pay that whopping 7 bucks to get it on your Kindle. Refresh your memory on the finer points and talk it up. People are discussing this stuff – Your Stuff – right now. And they’re ready to listen to you. There are NO LIMITS to Growth. The limits are only in the views that we humans have accepted to be truths, but that are truly only rote and easy habit. There are a far wider range of solutions that can pay all of the bills that we’ve stacked up and give every human being a new surplus.